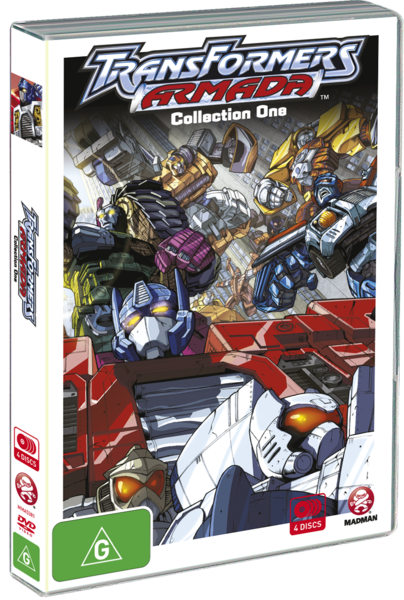 Transformers Armada Collection One is the first exciting volume of the early-2000's adaptation of the classic robot toy line. This version of Transformers starts off with a montage of the great Cybertron war and how the Autobots and Decepticons are fighting over smaller robots called "Mini-Cons". The Autobots end up sealing up the Micro-cons up in their own little dimension where they can be free and to also stop the Decepticons from using their power for evil as the Micro-cons are very powerful weapons. That doesn't stop the Decepticons from trying to destroy the Autobots and the two rival factions have a gigantic space battle which leads to the Autobots crashing into planet Earth while the Decepticons crash land into the Moon ("The Moon Moon?" to quote Ducktales (wooOOOhh)). Millions of years have past and we flash forward to a high school where we are introduced to three teenagers named: Bradley, Carlos, and Alexis. On one beautiful day we see the teenagers going spelunking in a mountain and come across mysterious devices deep inside the mountain. The mysterious devices are the Mini-cons and they end up partnering with the teens. After they have left the cave they are immediately confronted with a very angry Megatron who is after their Mini-cons. Before they are crushed by Megatron they are saved by a newly revived Optimus Prime who they become friends with shortly after. Optimus explains to the teens that something happened to the Mini-cons and now they are scattered all across the Earth and he recruits the teenagers to help the Autobots find the Mini-cons and stop the Decepticons. (Click "Read More" to read the full review). The Next Round Team tries to survive the Zombie Holocaust long enough to get saved by a chopper. Steam has rolled out its new tag feature with a hilarious wave of abuse! 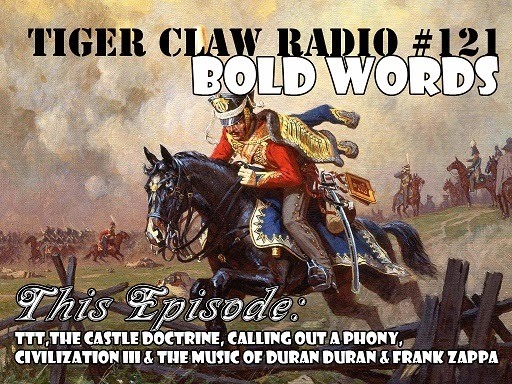 Check out the 122nd episode of Tiger Claw Radio! 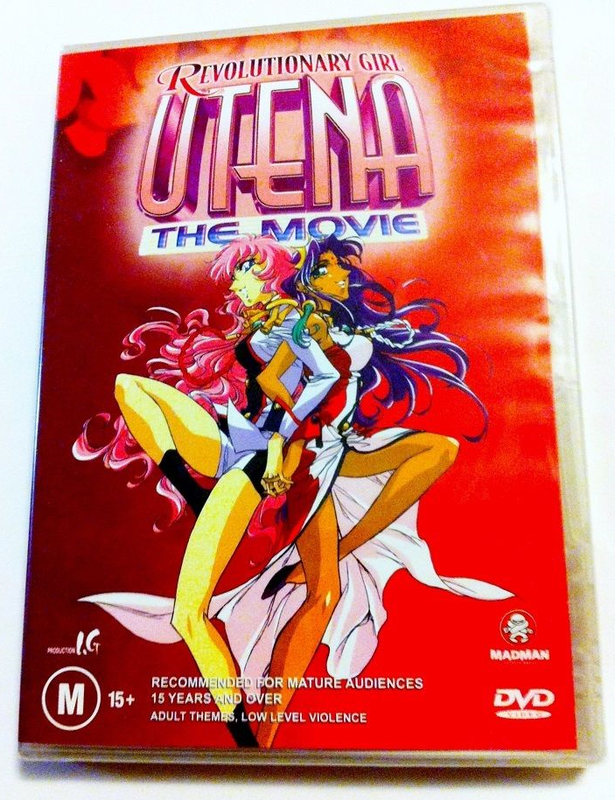 Revolutionary Girl Utena: The Movie is an animated fantasy action film. This film is about a teen aged girl named Utena who prances around in uniforms meant for boys as she has a goal of being a prince after being inspired by a life changing event as a little girl. Utena has also started her first year at high school and she make friends very quickly. During in between classes she is met up with an old childhood friend named Touga. The two of them have a chat about their past in which Utena becomes very uncomfortable and leaves. While out in a courtyard she notices a very beautiful rose garden on top of a staircase and decides to take a look. While up there she runs into a girl named Anthy and the two have a friendly chat about flowers. Not too long after they are interfered by a guy named Saionji who starts treating Anthy very badly. Saionji explains to Utena that Anthy is his possession as she is also known as "The Rose Bride" and whoever has her has the key to unlocking some really great power. Utena doesn't like how Anthy is treated and gets into a duel with Saionji with the winner becoming the Rose Bride's fiancée. Utena and Saionji have a very intense battle with Utena coming out on top as the victor and wins custody over Anthy. Shortly after the battle Utena learns that there is more to Anthy than meets the eye which may just cause Utena a lot of stress. (Click "Read More" to read the full review). Recorded live on Kaiser's 24th birthday! 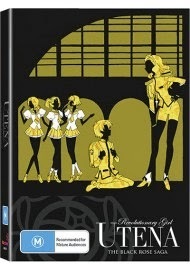 Revolutionary Girl Utena Collection Three contains the third (and final) season of this animated action drama television series. The saga for this series is called "The Apocalypse Saga" and it is the largest of the three season sets. Following the events of "The Black Rose Saga" (AKA Collection Two) we have Utena and Anthy move out from their dusty old dorm room and into Akio's (Anthy's brother) place. Akio's house is a very beautiful place to live and it also has a massive projector that's programmed to show star combinations on his roof as he likes to study the stars. Utena's life isn't in peace for very long as she is suddenly challenged by the student council members once again and Utena isn't too happy about it. The Student Council isn't doing it on their own free will as they are being manipulated into doing it. It is very shocking to see who is doing all the manipulation as it is all Touga and Akio's doing. That's right Akio has a much darker side to him and he uses his suave negotiation skills to seduce them all to the dark side. When I mean seduce... I really do mean seduce as he ends up sleeping with most of the people he convinces to join him (like a very horny Sith Lord from the Star Wars series). Meanwhile Utena is starting to have romantic feelings towards Akio without knowing his deep dark evil secret. (Click "Read More" to read the full review). Welcome to the second day of "Revolutionary Girl Week 2014" and on today's/tonight's edition we will be looking at the collection Two box set. 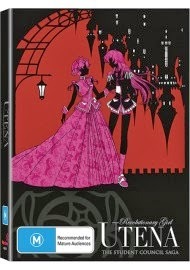 Revolutionary Girl Utena Collection Two contains the second season of the show titled "The Black Rose Saga". This show is about a teenaged girl named Utena who was met up with a prince while she was a small child. The prince gave her a special ring that ends up being a key to a dueling arena where she must fight to protect "The Rose Bride". After the events of "The Student Council Saga" (Which appeared in Collection One) Utena and Anthy decide to have a break and go visit Anthy's brother (Akio). They end up having a lovely chat with him and they are also introduced to his fiancee who is just the sweetest thing out there. Behind the scenes Akio's fiancee is in deep pain as no matter what she does she can't seem to get Anthy to like her. She ends up going to an old building at the school where a professor named Souji offers students some counseling for when they are feeling down. Akio's fiancee tells him all about her poblems and then Souji takes advantage of her depression by convincing her to take a ring of a dead duelist (a duelist in the same vein as Utena and the Student Council) so she can take revenge by dueling Utena. This is so that she can take The Rose Bride (Anthy) and murder her once she has won her. Utena accepts the challenge and beats her but she isn't the only victim of being corrupted and turned into a member of The Black Rose as there are others that even includes Utena's friends. 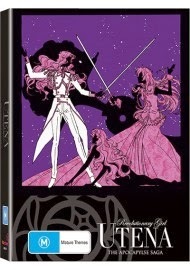 How will Utena handle the stress of her friends becoming corrupt? Can she save them? What will she do when she finds out that Souji is the ringleader? All this and more in this very personal season. (Click "Read More" to read the full review). Revolutionary Girl Utena is a show about a girl named Utena who goes around high school dressed as a boy because she wants to be a prince. She's not doing it for the sake of being a rebel as she has a reason why she wants to live her life as a prince. It all started when she was a little girl mourning over her parents death and while crying and wondering where life is going to take her next. From out of nowhere she is visited by a prince on a noble steed who tells her to look up and that life is just going to get better and then he kisses her on her forehead, gives her a very pretty ring of a rose to remind her of him, then he rides off into the horizon. Years later she is a very beautiful young woman attending high school with her best friend named Wakaba and a teacher who is always begging her to dress properly. While walking around the hall one day she notices one of the student council members (Saionji) hanging out at a greenhouse with a girl named Antony. Utena gets really mad when she sees Saionji beating up Antony and goes in to interfere but the domestic dispute is stopped by another council member (Touga). Later on she talks to Antony to tell her to not put up with the crap she goes to and then Saionji comes in. Saionji notices Utena's ring and then shows that he has one as well and reveals that people with that ring can duel each other to win "The Rose Bride" that ends up being Antony. Utena challenges him and then they walk into a forest that only duelist can enter to see that there is a dueling arena inside with a beautiful floating castle that's above the arena. Utena defeats Saionji and wins Antony and is told that there are other duelist out there who are willing to fight her to win Antony. Now Utena must keep on herself on her toes if she wants to protect Antony from being a prisoner of this deadly game. (Click "Read More" to read the full review). This episode is up a little early to make sure it actually makes it out. A new baby is due in my family on Tuesday. Enjoy some talk about Steam games, TTT, bundles, Civilization III, and some bold bold words. 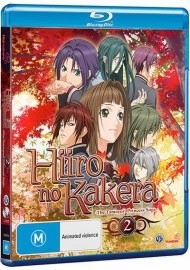 Hiiro no Kakera Season Two is a romantic fantasy show and contains the second part of this show's storyline titled "The Tamayori Princess Saga". Continuing right after the first season where we see our characters recovering after getting their butts whooped and moping over a very precious artifact taken from them by a group called Logos (pronounced "Low-gose" and not to be confused with "Low Goose"). This is where we see the toll of being a guardian really effecting the Five Guardians (Takuma Onizaki, Mahiro Atori, Yuichi Komura, Shinji Inukai, and Suguru Oomi) as we see Shinji and Suguru getting really sick of all the fighting. The two of them end up going to the enemy (Logos) to talk to them about something mysterious. Turns out Shinji has a dark past with them and just wants to talk with Logo's leader whom is a little girl named Aria Rozenburg. Suguru is going there for even darker means as he wants to join up with them outright. Shinji ends up getting treated like crap and is booted out while Suguru is accepted and Is now part of Logo's higher ranks. Tamaki Kasuga (the Tamayori Princess) is also facing some trouble as without the artifacts the seal that holds a world destroying demon has grown very weak and in order to seal the demon up for good they must do the unthinkable... They must sacrifice the Tamayori Princess as the seal requires her blood to lock up the demon and save the world. Takuma isn't happy at all about the situation and he starts trying his best to protect her from her dark fate. (Click "Read More" to read the full review). The Gaming Beast reviews this classic PC RPG gem from Bioware, which reinvigorated D&D themed video-games. 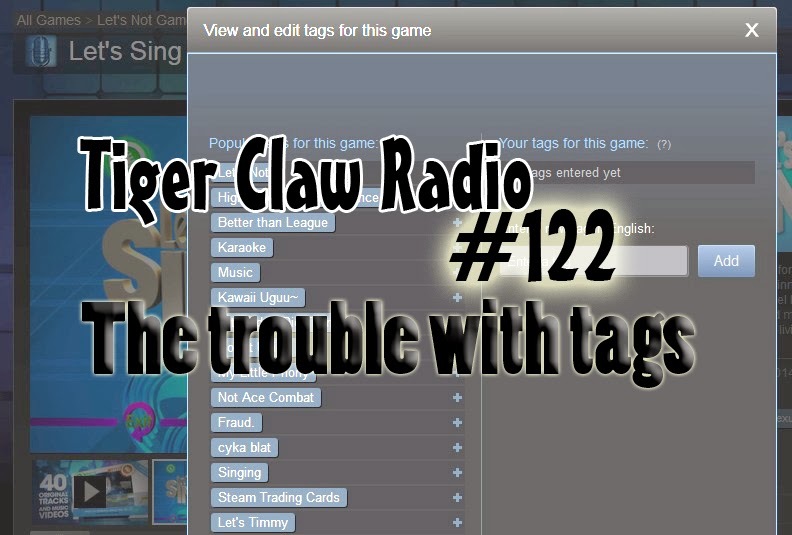 Tiger Claw Radio #120 - Habeeb it! Tiger Claw Radio returns after six months of silence to discuss Magfest 12 and the events taking place in the subsequent six months. Rock and roll! 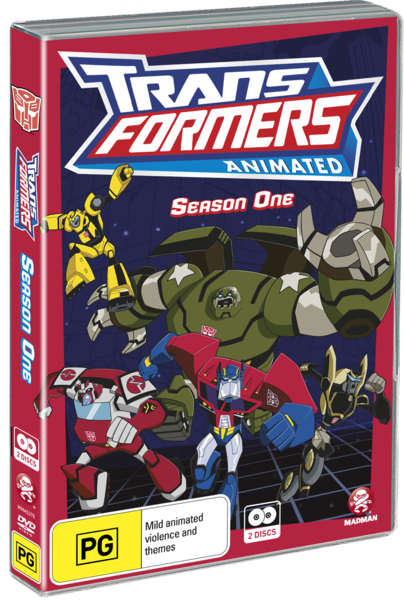 Transformers Animated Season One is an animated show about a group of Autobots (Optimus Prime, Bumblebee, Ratchet, Bulkhead, and Prowl) who were put in charge of repairing broken machines that were shot down in battle. While they are digging around on an asteroid for parts they begin talking about a very powerful device called "The Allspark" which they all think is a myth. Shortly after we see an explosion and from out of that explosion we just happen to see that the Allspark just happened to be (conveniently) buried in that asteroid. As soon as they dig out the Allspark they get caught up in a battle with the Decepticons (lead by Megatron) whom have been searching the entire galaxy for the Allspark. Megatron gets into an intense battle with Optimus Prime but is finished abruptly due to Starscream's clever placement of a bomb on Megatron's back. Starscream takes control of the Decepticons but his moment of glory is cut short when something bad (which I won't say) happens to him. The Autobots and Megatron end up crashing into a modern day planet Earth with the Autobots crashing into the ocean while Megatron crashes into a farm where a young boy finds him. Fifty years later we cut to a futuristic Detroit, Michigan where the Autobots awaken from their slumber. After the Autobots repair themselves they run into a battle with a giant insect and make friends with a little girl named Sari who manages to get a key to the Allspark. Now the Autobots must protect the Allspark and Sari from evil that want the Allspark's great power and/or to destroy Detroit. (Click "Read More" to read the full review). Action Hero Fighter Session 4 - Power Force III - Maximum Payback or DIE TRYING!!! Magnum Poundstone and Adrian Stryker attempt to stop a evil plot by the Scorpion Venom Corporation to sink a luxury liner and steal and atomic bomb! Action Hero Fighter Session 3 - Fatal Danger! Two cops try to stop a hopeless hostage situation. Alex Swingle is the Director and Kaiser and Darabka are the players/actors.